I love fancy desserts as much as the next person, but sometimes I just want a piece of cake. 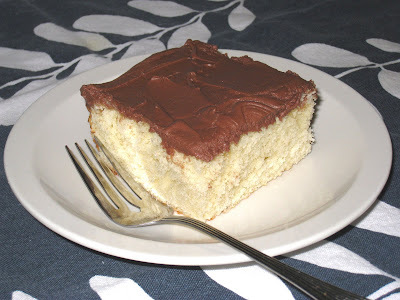 A nice piece of yellow cake with chocolate frosting can be the perfect dessert. Add a cup of ice-cold milk and it is the perfect dessert. I had a standby recipe, but it has been a long time since I have made this cake and I have no idea where the recipe has gone. It isn't in any of my older notebooks or recipe boxes, and it was harder than you would think to find a replacement. I had a different recipe in one of my notebooks, a recipe that called for quite a bit of butter, but it actually came out dry. If you're going to use that much butter, you have the right to expect a moist, rich cake. I won't be using that recipe again. I did some more searching, and finally decided to try a recipe I found at baking.about.com. It is a simple recipe, easy to follow, and it came out moist and delicious. The chocolate icing is from an old family recipe. I made this for our end-of-month lunch at work. Everyone seemed to like it, as evidenced by how quickly it disappeared. This would make a lovely dessert for a barbecue or a picnic in the park. It travels well and pairs nicely with ice cream. Preheat oven to 350°F. Grease and flour a 13- x 9-inch baking dish. Combine the flour, baking powder, and salt in a medium-sized bowl and mix briskly with a whisk. Cream butter and sugar together until light and fluffy. Beat in the eggs, adding them one at a time. Add the vanilla and mix well. Slowly add the flour mixture and the milk, alternating between the two, starting and ending with the flour mixture. The batter should be smooth by the time all of the dry and wet ingredients have been incorporated. Pour the batter into the pan. Lift it up and let it drop against the counter once or twice, to release any air bubbles. Smooth the top with a spatula until it is even. Bake at 350 deg. F. for 30 to 35 minutes, until a toothpick inserted into the center comes out clean. Remove from the oven and place on a wire rack. Allow to cool completely before frosting. For a layer cake, divide batter between two 9-inch greased baking pans and bake for 20 to 25 minutes. Let cool for 5 minutes, then invert cakes onto a plate. Let cool completely before layering and icing. Notes: The butter and vanilla are the only constants in this frosting recipe. The rest of the ingredients are added gradually until the desired taste and consistency is achieved. A hand mixer is not necessary, but it does make it easier. Use a wooden spoon and mix vigorously. In a medium bowl with the softened butter, add 3/4 cup of the confectioners sugar, 2 tablespoons of the cocoa, about 2 tablespoons of milk, and the vanilla. With a hand mixer, beat together at medium-high speed until they ingerdients come together. The mixture should be thick, but not too dry. Add confectioners sugar, cocoa and milk in small amounts, mixing and tasting each time, until the frosting reaches the desired flavor and consistency. Can be used immediately on a completely cooled cake. Let the frosting set before covering up the cake. If not using immediately, cover the frosting with plastic wrap so it doesn't set in the bowl. Can be frozen and used at a later time.